In the 100 years following the opium ban in China, British exports of opium to the country grew astronomically from around 15 tonnes annually, to 1,400 tonnes exported in 1838. China's Daoguang Emperor was growing increasingly concerned about the British engineered levels of addiction, and in 1839 took action. Viceroy Lin Tse-hsu petitioned Queen Victoria for help in ridding China of, “those who smuggle opium to seduce the Chinese people and so cause the spread of the poison to all provinces. Such persons who only care to profit themselves, and disregard their harm to others are not tolerated.” He was ignored, but the Emperor acted, boldly instructing the confiscation of 20,000 barrels of opium and detaining foreign traders. Domestically, the illicit opium trade would no longer be tolerated and a number of users were publicly executed to send out a strong message. At this time, British trade interests came before all others and the country's response highlighted this through its aggressiveness. 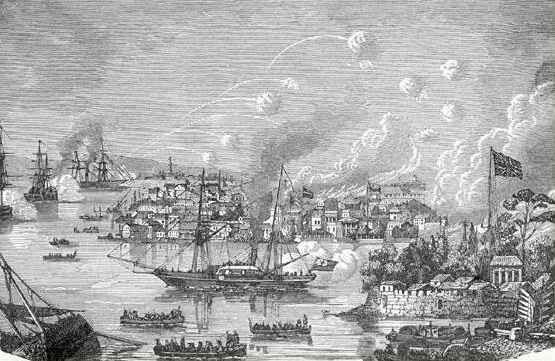 An enormous British-Indian army was sent to China to exact punishment in what came to be known as the First Opium War. The British seldom stepped off their ships, and in all, 20,000 Chinese causalities would be sustained in the imperial assault. British arms were the most advanced and destructive in the world and her warships wreaked havoc on coastal towns; they took Canton (Guangzhou), sailed up the Yangtze and grabbed the tax barges where they could. By 1842 China begged for peace. China was forced into paying an indemnity, ceding Hong Kong to Britain and opening up to “free trade." As a result, Britain was able to continue flooding the Chinese market with opium, ensuring that abuse remained high until its Empire collapsed and the uncompromising ferocity of the Maoist revolution in the mid 20th century and preceding years of totalitarian rule curtailed demand, and supply with it. Britain’s imperial past is littered with episodes of greed and brutality, but even at this time, the episode was questioned in parliament. Future Prime Minister William E. Gladstone, in reference to the opium war, rightly posited whether there had ever been, “a war more unjust in its origin, a war more calculated to cover [Britain] with permanent disgrace." While Britain was pushing opium in China, it also supplied a sizeable market at home. Back in Britain, along with tea and sugar, opium was a sought after and exotic commodity of the Empire. Absent was any of the now familiar moral condemnation. British imports of opium rose from 41,277 kg in 1830 to an astonishing 127,006 kg in 1860. It was commonly used in home remedies and recreationally for the bored and privileged -- particularly with pre-Victorian and Victorian artists and writers. The arts community and entire Romantic Movement became fascinated by the drug. The British writer Thomas De Quincey wrote his memoir Confessions of an English Opium-Eater chronicling his opiate use. Percy Shelley, John Keats and Charles Dickens all famously fell victim to opium’s allure. Later, Lewis Carroll would dream of the mad hatter in an opiate induced haze. Even history's most famous nurse, Florence Nightingale, was discovered to be a user of opiates after her death. Opium use was by no means the preserve of the elite, either. So-called “opium eaters” from the lower classes also numbered highly in Victorian society, partly due to their poor living conditions, lack of access to healthcare and subsequent use of the drug as a form of self-medication. In 1868, concern over domestic use rose and the Pharmacy Act was installed to limit the place where opiates could be sold to only registered pharmacists. The act managed to cut use in the UK compared to that in the US where it was still largely unregulated, yet, until the end of the 19th century, few doctors and scientists warned about the dangers of opium addiction, and opiates were still being liberally prescribed for mild ailments up until the 1950s. The contrast with today is breathtaking. Now, we fight a “war” on opiates, where once we fought equally bloody wars to push their consumption, and their use is demonized. How did this attitudinal shift come to pass in the 20th century?